Who Is the Best Residential Fence Company in Manassas? You don’t need a blog telling you what type of fence works best for your home. You know what you want. What you need to know is which residential fence company in Manassas, Virginia is the best. The answer: Hercules Fence. As the largest fence company based in Virginia we have the luxury of purchasing the fence you want at a price you will love. For more than 50 years, Hercules Fence has been providing exceptional fence services to the people of Manassas, developing a strong reputation for professional service and quality installation. Why would you trust anyone else with your new residential fence? Click Here to browse our vast residential fence options. Improved Home Value: With a return on investment of roughly 50%, a new fence is a great investment in your future. Plus, they look good, which brings us to No. 2. Look at That Curb Appeal: A new fence is an excellent way to instantly improve the curb appeal of your home, which will also make your home easier to sell when the time comes. Holy Increased Security, Batman! Did you know that a property crime occurs in the United States every 2.1 minutes? Manassas homeowners, in particular, have a 1 in 44 chance of becoming a victim of property crime. Property crime includes, among other crimes, burglary, larceny, theft, motor vehicle theft, arson, and vandalism. A fence that is not easily climbed and has a lockable gate is a great deterrent for crime. Additional Benefits: Privacy, block wind and noise, protect your swimming pool, etc. 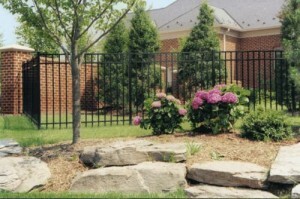 Click Here to learn about choosing the right residential fence. If you have any questions about Residential Fence Installation, please contact Hercules Fence of Manassas, Virginia by calling (703) 551-2609 or visiting our website. You can also follow Hercules Fence on Facebook, Twitter, Google+ and YouTube! This entry was posted on Wednesday, August 27th, 2014 at 6:02 pm. Both comments and pings are currently closed.